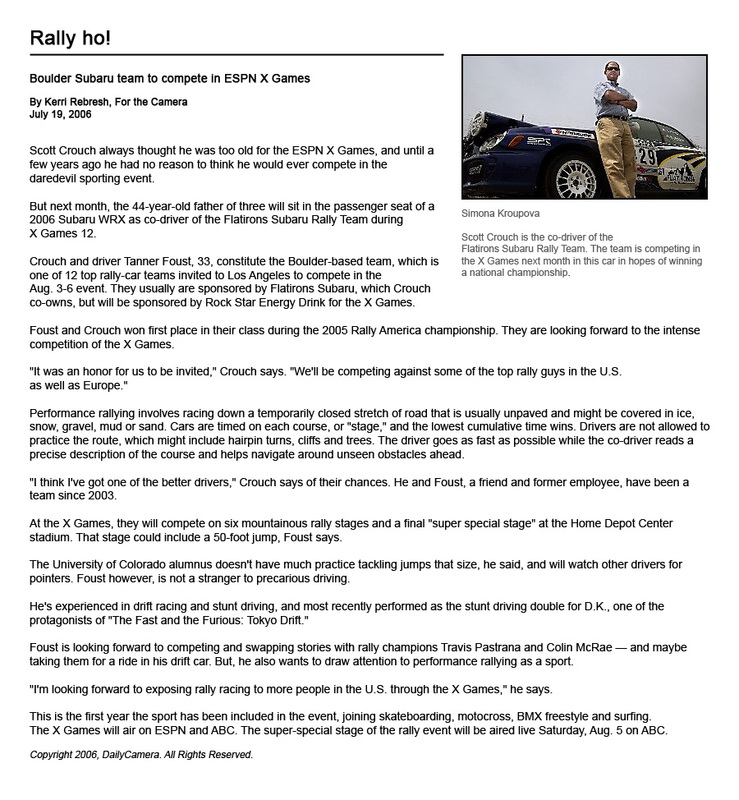 After over two months since the 100 Acre Wood National Rally the Flatirons Subaru and Tuning Rally Team traveled to the Oregon Trails National Rally in Portland, OR, to continue their defense of the 2005 Rally America National Production GT Championship. After taking commanding victories at the first two events of the championship, the Flatirons Rally Team was anxious to continue their season. The 2005 running of the Oregon event was the first year that the Boulder, CO team traveled to the Pacific Northwest round of the Rally America National Championship. The Oregon Trails National Rally marks a unique challenge for championship teams. This long running Pacific Northwest event attracts a large number of experienced non-championship registered teams whom promise to figure into the overall results in their classes. “Oregon is kind of a tricky rally for the championship, you really have to drive smart and big picture. As a driver you don’t want to make a costly mistake or worse fail to finish the event because you were racing a team for event position that’s not registered for the championship,” commented driver Tanner Foust. Event festivities got underway on Friday, April 21, when teams set out to tackle a total of six special stages held at Portland International Raceway. The Portland International Raceway special stages provide 10.4 miles and less than 10% of the total event mileage but the mixed surface stages can prove tricky and teams had to be careful to not make a mistake that could damage their vehicle. As luck would have it, two teams in the rally suffered crashes and other teams suffered mechanical damage on the stages, proving the risks the short stages pose. For the Flatirons Subaru and Tuning Rally Team Friday night was relatively un-eventful. Driver Tanner Foust and co-driver Scott Crouch decided to attempt to drive smart on the Portland International Raceway stages. “Our goal was to be fast but not too fast. On such short stages it’s hard to pace yourself and we certainly didn’t want to start with a big gap to close but we didn’t want to take any chances,” noted co-driver Crouch. The strategy was evident in the stage times. Three different teams took their turn setting fastest time for Production GT over the 6 stages, with rival team Carolina Rally Sport driver Matthew Johnson taking three of the six stage class wins and a 2.5 second lead into the overnight stop. Saturday started with the rather short Special Stage 7, a mere 5.00 miles. Just because SS7 isn’t very long doesn’t mean wasn’t challenging, teams experience a vertical climb of over 1,700 feet over a period of 4 miles making sure the Production GT teams stay honest and really push to keep their corner speeds and momentum high. Foust put his high altitude driving experience to use but it wasn’t enough to take the fastest time on the stage, that honor went to Canadian Norm LeBlanc, whom was the fourth driver to take a top time in the class. Foust and Crouch’s fast pace was enough however to put them in front of class leading driver Matthew Johnson. Going into the first Saturday service break after only one stage the Flatirons Rally Team found themselves in a familiar position, leading their class by 9.4 seconds. Special Stages 8 and 9 were situated between a pair of services and marked a decisive point in the early portion of the rally. Special Stage 8 was a significant departure from the rally’s earlier stages at 19.68 miles in length. This long stage could prove to be decisive at this early stage in the rally. With less than 16 miles completed so far and the field already starting to settle into running positions it was key to come out pushing for the Flatirons Rally Team. Trusting in their sturdy Flatirons Tuning maintained Subaru WRX, the team set out to try to open up a bit of a cushion. “Special Stage 8 was a very important stage for strategy. Compared to the other stages run before, it was super long, we really had to push and pace ourselves and hope that it was enough,” reflected co-driver Crouch. The team nailed their pacing and took the stage by 24 seconds and the class lead by 45.1 seconds. With the momentum back in their corner the team returned to early season form and took Special Stage 9 by 13.6 seconds and extended their lead to just under a minute going back into the service area. Special Stage 10 was 6.40 miles but that didn’t stop Quantum Motorsports Driver Eric Langbien from blitzing the stage and taking a class win over the Flatirons duo. Langbien had been on a mission to catch the Flatirons pair when he rolled on Special Stage 8. Only suffering a soft roll and no major damage the team continued. After almost being put a minute behind Foust and Crouch the Quantum driver was determined to claw his way back into threatening the leader. Special Stages 11 and 12 marked the end of the second day of the Oregon Trails National Rally with 10.9 and 7.26 miles of competitive driving respectfully. After building up a comfortable margin in the earlier stages Foust and Crouch decided to “take it down a notch” and make sure that they made it to the end of the day with out damaging the car. Rival driver Eric Langbien and co-driver Jeremy Wimpey had been on a charge trying to close the gap and fight their way into first place. Their pace and determination was evident as they kept up the pressure up on Special Stage 11 and took the class victory. Matthew Johnson also made a resurgent effort as both finished ahead of Foust and Crouch. Despite finishing third in class on Special Stage 11 the Flatirons Rally Team maintained their lead, but it was down to 50.1 seconds. Special Stage 12 was the last stage of the evening and while the Flatirons Team had gone back out in front, the competition was fierce on the special stage. Foust and Crouch took the stage class win but both rival drivers Langbien and Johnson finished within 4 seconds proving their pace and determination. Unfortunately the pressure being applied by the Quantum Motorsports Team proved to be too much for the transmission in their Subaru WRX rally car as they damaged third gear, crippling the team’s ability to be competitive on the final day. Despite the transmission problems Langbien and Wimpey did however finish Saturday second in class and 54.1 seconds behind Foust and Crouch. Championship rival Matthew Johnson and co-driver Kim DeMotte were in prime position to take over the second in class position of Langbien and Wimpey. With such a tight championship in 2005 and the best 7 of 9 events counting for the championship in 2006, every point matters at all the events. Sunday, April 23, 2006, marked the final day of competition. Flatirons Rally Team rival driver Matthew Johnson had come out strong on Friday but struggled all day on Saturday as he drifted back from the class leaders. In a showing of the camaraderie amongst competitors in the class Johnson looked to his championship rivals Foust and Langbien to help find out why he was off the pace. After conferencing with his rivals Johnson made the suggested changes to his suspension settings. Special Stage 13 was the first of the last day at 9.51 miles. With the changes made to his competition vehicle after conferencing with his rivals Matthew Johnson blasted through the stage to take the stage class win by 4.5 seconds over Flatirons driver Tanner Foust. Special Stage 14 was a re-run of the same roads as Special Stage 13 and Johnson wasted no time again taking the stage class win in front of the Flatirons Rally Team winning the stage by 10.4 seconds. Quantum Motorsports team drifted back. Despite giving up almost 15 seconds in two stages the Flatirons Subaru and Tuning team was relatively secure in their lead of 1:13.00 over second place Johnson. With 38 competitive miles remaining the Flatirons team turned their focus to just maintaining a competitive pace and staying on the road instead of trying to get out in front of their rivals. “We have a pretty big lead over Matthew, but we are having some issues with the transmission, it has slipped out of gear a couple of times and second sounds “crunchy”. If we lose a gear or the transmission itself the lead we have built would mean nothing,” commented driver Foust. Crouch later added “we’ll see how this transmission issue affects our times, it is now in Tanner’s head that there is a problem so maybe it will slow us down” reflecting on the mental challenge a mechanical problem poses. The Flatirons Rally Team service crew had changed the transmission to a fresh unit before this rally and decided to flush the transmission during the service stop incase there was lose metal in the transmission case. Unfortunately the Canadian team of Norm LeBlanc and Keith Morrison had transmission problems in their Production GT Subaru WRX and decided to buy the last transmission available on the Subaru Parts Support truck so if the transmission has a gear fail the Flatirons Team may not be able to repair the transmission in time putting their lead in serious jeopardy over the remaining four stages. Maybe it was fate, or the mental demons that a mechanical problem can cause but Special Stage’s 15 and 16 were disastrous for the Flatirons Rally Team. After about six miles on the ten-mile Special Stage 15 the team suffered sudden brake failure loosing braking to two wheels on the car and making the car very difficult to slow and unpredictable under braking. "Every time I touched the pedal it went to the floor and the car went sideways", said Foust. Complicating matters, the team suffered a right front puncture shortly after they discovered the brake problem, perhaps from the same incident that damaged the brakes. Either way the team lost 1:22.00 to main rival Matthew Johnson on Special Stage 15 and then lost a further 1:00.4 to Johnson on Special Stage 16 arriving to the service break unsure of the cause of their problem and 1:09.5 behind Johnson and just .6 seconds ahead of third place Langbien and Wimpey. The team returned to service where the Flatirons Rally Team service crew set about repairing the damage to the car, anxious to evaluate the car and send the team out to the stages to make up the lost time. Luckily when the team experienced a flat tire and subsequent shredding of the tire and damaging of the fender the flailing pieces of rubber didn’t cause any un-repairable mechanical damage. After getting the vehicle repaired back in service and the brakes back to fully working Tanner and Scott set out to make up the lost time from Special Stages 15 and 16. While Canadian Norm LeBlanc showed the pace he lacked earlier in the rally and took the stage class win on Special Stage 17, the Flatirons Rally Team was able to finish the stage 18 seconds faster than now class leading Matthew Johnson. Realizing the deficit would be too much to overcome with out a problem for Johnson the Flatirons Team set out aiming for a strong finish on Special Stage 18 deciding to “let the chips fall where they may”. LeBlanc took the stage win on Special Stage 18, but the Flatirons Team finished second in the class and a further 5 seconds ahead of Johnson and co-driver DeMotte. When all the dust had settled and the times had been recorded the Flatirons Subaru and Tuning Rally Team finished second on the stages in Production GT behind rival Matthew Johnson and co-driver Kim DeMotte. Unfortunately for the Flatirons Team a penalty incurred during their mechanical difficulties on Special Stage 15 and 16 earned them a 10 minute penalty when they worked on repairing the fender in the start control for Special Stage 16, dropping them down to fourth in class for the event and third of the championship contending teams. The Flatirons Subaru and Tuning Rally Team would also like to thank RallyNetCast.com. This event marked the first event of the season for the service, which provided streaming in car footage from various top teams to viewers over the Internet. Fans can now watch in car video of their favorite top teams in a variety of classes in an almost real time net cast, seeing every turn, spin, and roll. The Flatirons Team invites all of their fans and rally fans in general to join them over the Internet on rallies for the rest of the season! Flatirons Subaru, in Boulder, CO, is the largest Subaru dealership in Colorado and is proud to once again support the Flatirons Subaru and Flatirons Tuning Rally team. Vishnu Tuning, The Boulder Bump Shop, Beta Tools, Red Line Oil, and Sparco have again joined the team with sponsorship support for the 2006 season. The team is comprised of professional performance driver, stunt driver, Drifter, and Ralliest Tanner Foust, and Flatirons Imports General Manager and co-driver Scott Crouch, along with the excellent technicians at Flatirons Tuning who prepare the car and at times travel to events to provide technical support to the team in their quest to for excellence. RallyAmerica Ltd. is based in Bethel, MN, and is the sole sanctioning body for the Rally America Championship. Rally America and its competitors are supported by Subaru of America, Racetech, PIAA lighting, and Hankook tires. The Rally America Championship is composed of 9 selected Performance Rally events, the best seven of which are scored for teams in the national championship.